At first light, the crowd began to search for the rabbi. They remembered the bread and fish he'd fed them and they were hungry again. Amon, son of Azor, looked out over the sea of Tiberius. "Where did he go?" His youngest brother, Eliud shrugged. "Who knows? Only one boat sailed for Capernaum and he wasn't in it." "Bah, that makes no sense. Listen boy, when it gets light, we'll join the others and search for him." "You'll search, big brother. They say more boats are coming and I, for one, will take passage to Capernaum. I can get a decent meal there." "They say—if rumors were fishes, my stomach wouldn't be empty," Amon grumbled. Boats did arrive. Eliud pushed his way through the crowd and found a seat on one. A brisk wind sent sea spray into his face as the boat headed to Capernaum. In moments, he was wet and shivering. He pulled his robe tighter around himself. Amon would say he'd gone off on a fool's errand. As the firstborn, Amon would often give him orders. But not this time. Eliud's jaw tightened. I need to stop listening to him. Who knows where the rabbi is? We both should be back in Bethlehem tending Father's sheep. The boat docked at Capernaum. Eliud stared in amazement. A crowd had already gathered around the rabbi. "Please rabbi, teach us," a man called out. Yeshua (Jesus) recognized him. "You didn't come for teaching. You came because you ate my bread and were filled. His glance went from one to the other. When his dark eyes met Eliud's the boy felt they searched deep within his heart. A murmur went through the crowd. A man with a child on his shoulders turned to his companion. "What foodâ€”what's he talking about?" The other shrugged. "I don't know, but I'll find out. Rabbi, what work must we do to get this food?" The man threw up his hands. "He talks in riddles. I suppose he means he's the one God has sent. I don't understand him." The child squirmed and the father lowered him. "Well, neither do I. This little one needs his mother. I'll hear the teacher another time." Eliud's stomach told him he also needed another time to hear the rabbi. As he walked toward the inn, he heard Yeshua say, "I am the bread of life. He who comes to me will never go hungry." John 6:35. Eliud shook his head. But my stomach is empty. I just don't know. 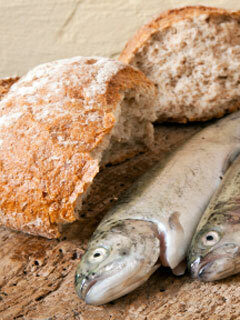 On the Sabbath, Yeshua again spoke about bread. He told the men gathered in Capernaum's synagogue he was the living bread from heaven. His voice rose as he said, "Whoever eats my flesh and drinks my blood will have eternal life." The murmuring around him became shouting. The men shook their fists. Eliud removed the prayer shawl from his head and hurried out of the synagogue. Sitting in the shade of a nearby tree, he buried his head in his hands. Eat his flesh and drink his blood—even Samaritans don't do such things! One of the Teacher's Talmidim, (students) followed Eliud out of the synagogue. Eliud recognized the big fisherman—the one called the rock. "You shouldn't have hurried off. The Master explained his words. They were spirit words, not flesh. He often speaks of his Father's kingdom in spirit words." Eliud looked up. "I still don't understand." The fisherman chuckled. "Well neither do I, sometimes. But this I know. Yeshua is the Messiah. I believe that with all my heart." "No, that can't be. There's a story my people tell around the campfire. We're shepherds from Bethlehem. Long before I was born, my grandfather said he saw a band of angels one night. They were praising God because the Messiah had just been born in Bethlehem. Everyone thought Grandfather had been out in the cold too long, but our rabbi said he was right. Scripture says the Messiah will come from Bethlehem." "Yeshua was born in Bethlehem." "But they say he comes from Nazareth." "He was raised in Nazareth. But there was a Roman census the year the Master was born. Like everyone else, his parents travel to their birthplace, Bethlehem." Eliud was silent. Bethlehem—the house of bread; and the Master said he was the bread sent down from heaven. He stroked his growing beard, remembering the bright star his grandfather said he had seen that night. In his mind's eye, Eliud saw that same star. As the youngest son of Azor, he had no inheritance in Bethlehemâ€”or did he? "I—I would like to learn more," he said. "Then come sit at the Master's feet. He'll teach you." "But I'm not one of the chosen ones." Peter smiled. "Everyone is welcome. The Master turns no student away." As they climbed the steps of the synagogue, the doors flew open and a crowd of men pushed past them. Still shouting and arguing, they hurried away. With his twelve talmidim around him Yeshua asked, "You do not want to leave too, do you?" John 6:67. Peter answered the question with another question. "Lord to whom shall we go? You have the words of eternal life." John 6:68. In the days that followed, Eliud sat with others at the Master's feet. He hungered for Yeshua's teaching and was filled. Very gradually, he began to see his own worth fulfilled in the promises the Teacher gave. The day he believed Yeshua was the Messiah; he received an inheritance which would never pass away.